Husky 6 gal air compressor is ideal for cleaning, inflating, and powering nail guns. The main advantage of this air compressor is that it has oil-free pump. Husky 6 gallon air compressor delivers 2.5 SCFM at 90psi and 135psi max. pressure. It also includes a quick connect fittings, 25 ft. air hose, 18-gauge 2 in. brad nail gun, and an 16-gauge 2-1/2in. finish nail gun. In addition, this 6 gallon air compressor has a very comfortable handle, so you can easy move it in any place at your workplace. Its weight is 49.6 lb, but for 6 gal air tank capacity this quite appropriate weight. This air compressor does not look like all the other models because its air tank is shaped like a Pancake. Therefore it got such nickname. Many people say that oil-free air compressors are noisier than oil lubricated, well yes it is. But oil-free pumps have a lot benefits. First of all they are cheaper than the oil-lubricated analogues and secondly there is no need to constantly monitor the oil level. In addition, this compressor has proven itself in due time as one of the most reliable 6 gal air compressor. 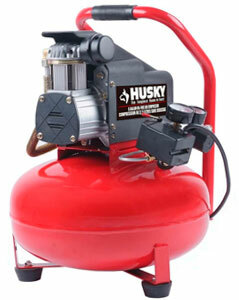 As Husky 6 gallon air compressor has oil-free pump its maintenance is really easy for everyone. Just read carefully your manual for it and repeat all recommendations periodically. Overall if you are looking for the quality air compressor at a good price you definitely should pay more attention to this Husky Pancake air compressor. If you still have doubts then try to imagine what air tools you want to use with it and after that, answer the question: 6 gallon – will be enough to you or not?